Waking up in Delhi each morning is a tiresome job. Once you get up and go out you are welcomed by bad air quality that averages above 300 AQI (Air Quality Index) value. Current pollution level in Delhi still continues to be very poor due to a change in climatic condition. So, instead of breathing fresh air in the morning, the residents of Delhi start their day by breathing air that is almost toxic. Usually, a thick blanket of fog covers the national capital in the morning and the rest of the day features a really bad run of air quality throughout the day. 300+ AQI level is the daily average quality of the air in Delhi which is very bad. Sometimes, it goes up to 500+ AQI level which means that the air quality level often reaches a hazardous level. All people in Delhi know about the air pollution situation happening around. Technically, only a few people have the information of AQI (Air Quality Index). On 8th January 2019, the quality of air in Delhi improved last week due to the sudden rainfall. We could see the very clear sky with the good AQI values in the evening around 2:30 pm to 6: 30 pm. On that day, Delhi AQI was 69 (µg/m3) which stands at moderate air quality. This was a very rare surprise in Delhi as the residents have not expected such a thing would happen. 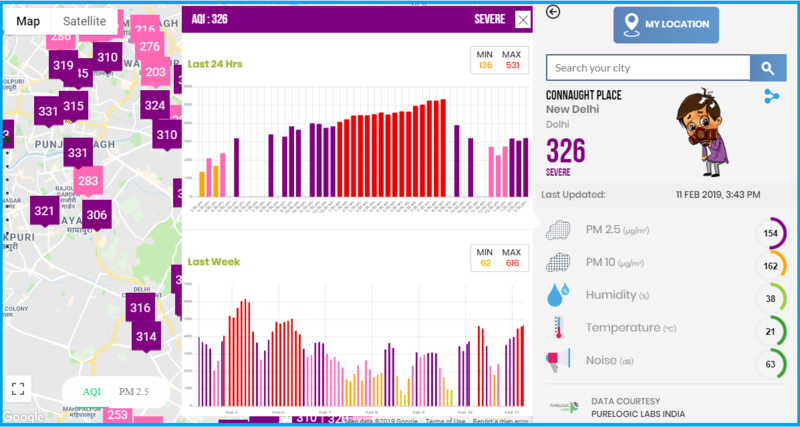 PM2.5, PM10, temperature, humidity & noise were all normal during the following evening. Earlier the Pollutant Standards Index (PSI) was the standard system to measure air pollution. It was later renamed as Air Quality Index (AQI). It is a uniform system developed by U.S. EPA to enable the public to determine whether air quality levels in a particular location are good, moderate, unhealthful, or worse. Though we know the current pollution level in Delhi is getting worse day by day, we haven’t taken enough steps to protect ourselves from it. We all need to know that it’s never too late to start finding the solution of how to reduce and protect the air pollution level in Delhi. Everyone in Delhi has the same responsibility to reduce the pollution level. Until and unless we take care of ourselves and society, the situation is only going to get worse. We need to look at it in this way – Since we blame the Government to take responsibility for the pollution situation, we as a public need to take responsibility to take care of the situation too. RT @vishwamTOI: India bans import of solid #plastic waste/scrap into the country.